Hi friends, it's been years since I had a vacation. It was well overdue. So, last week, I caught some rays at the beach. Soooo relaxing. The kids thought it was the best vacation ever. But it's been so long since we had one that they really don't have a solid reference point. I wanted to wear a sea life manicure for my trip, so I used a pretty teal blue glitter flakie base color with multi-color stamping, reminiscent of ocean life under the sea. 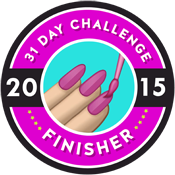 And here's the shocker: I wore this manicure for the entire week! I can't remember the last time I wore a manicure for an entire week. Great achievement. My next mani is a summery gradient with a touch of sun.